Now a days, People make a lot of search to hide their important data in computers as well as in Mobiles. 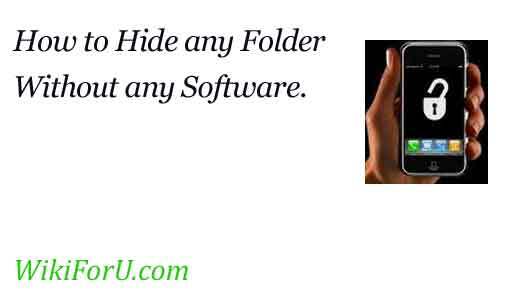 Their is a wide range of Mobile Applications that let you Hide your Important Documents on your Mobile. For Example : File Explorer or File Hide etc. These Applications available for free on internet. But in case if don't have an internet Connection or your Phone is not Supporting that Application, then don't mind. Because i have a very good and simple trick to hide any folder in your Mobile.This Trick is Working Fine for All Java Enabled Phones mean this will work on Nokia, Samsung, Sony Ericsson, LG etc. For Example i have a folder in my Mobile Named WikiForU. 2. Now Create a New Folder with same name but with .jar extension. Ex- I created a new Folder and name it WikiForU.jar. That's all. Now my Original Folder WikiForU.jad will be hided and a new folder WikiForU.jar is available that is empty. Please keep in mind that the main folder, which you want to hide and in which your data is kept that should be renamed to .jad and the other fake folder should be renamed to .jar. Dear, Its not working on Samsung Mobiles. We will find a new one as soon as possible. If you find this before us , then plz let us know by commenting here. Dear its very simple to unhide...simply rename .jar(i have worldtricks.jar in this example) folder to anything else or just remove .jar from that folder and you can see your folder with jad extension. Please reply if you still have any problems.